The company also produced a coal model for a short time- named Tempcoal. For a number of years, the top-loading downdraft Tempwood 11 and V models have carved their own special niche as efficient, heavy-duty plate steel wood stoves, available at affordable prices. The main feature is the downdraft, which allows secondary air to be induced naturally. 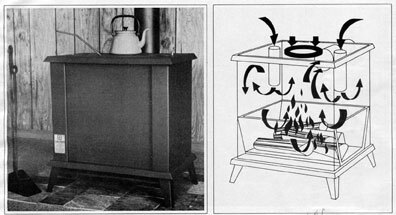 Gases rise off the fire and are forced downward by a thrust of air between two downdraft vents and are then recirculated. Tempwoods are especially noted for their ease in startingheat radiates within seconds after lighting the fire. Tempwoods also hold their fire, thus requiring very little attention or going hack and forth to the woodpile. Many Tempwood owners swear by these models because of the neatness and safety features. Since Tempwoods topload, sparks and hot ashes wont spill out onto the hearth. When the lid is lifted, sparks and hot coals die down due to increased velocity and negative pressure. As a result, smoke and flyash cant escape to do their dirty work. All Mohawk stoves are tested by IJL or tested by independent laboratories in accordance with UL standard 1482. The Tempwood V is approximately 4 inches smaller than the Tempwood II in all directions; it weighs 127 pounds and is rated at 35,000 BTU/ hour. There is a Mohawk model for every need. Also available are a variety of Mohawk accessories: coal hod and rake; shovel and poker set; fireplace Damper panel; flue adaptor; hot water panel; attractive decorator kit; log holder. Write for further details. Specifications below are for the Tempwood 11 UL listed. Write for information and details on the newly designed Tempwood.